The central bank should act now to support the currency and get ahead of the curve on inflation, otherwise it may need to take more drastic measures later. The Hungarian forint has devaluated by nearly 7% since the beginning of the year, reaching an all-time low of HUF 330/EUR on July 2. 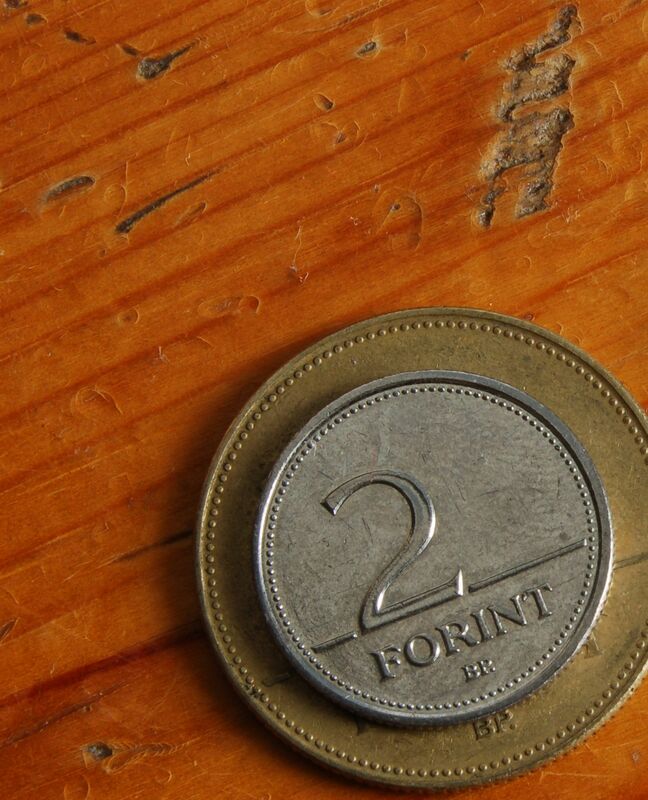 Since then the forint has somewhat strengthened, but remains significantly weaker than in previous years. Part of the devaluation can be explained by the changing international environment. US rates are rising, and the ECB is set to start tightening monetary policy next year, indicating the end of the period of extremely low interest rates on global markets. Other countries in Central, East and Southeast Europe (CESEE), such as Turkey and Romania, have also seen their currencies weaken recently. The communication of the central bank has also contributed to forint weakness. The central bank declared that it sees no danger for its 3% inflation target from rising global inflationary pressures. In the central bank’s opinion, the global economy is still characterised by low inflationary pressures. Therefore, the central bank sees no reason to change its policy of maintaining the current 0.9% policy rate, and its unconventional measures to provide ample liquidity for the banking system, both of which it argues are necessary to support economic growth in Hungary. June inflation data, published on July 10th, brought no unpleasant surprises. Year-on-year consumer price inflation was 3.1%, a bit lower than expected by consensus. Year-on-year core inflation was 2.4%. 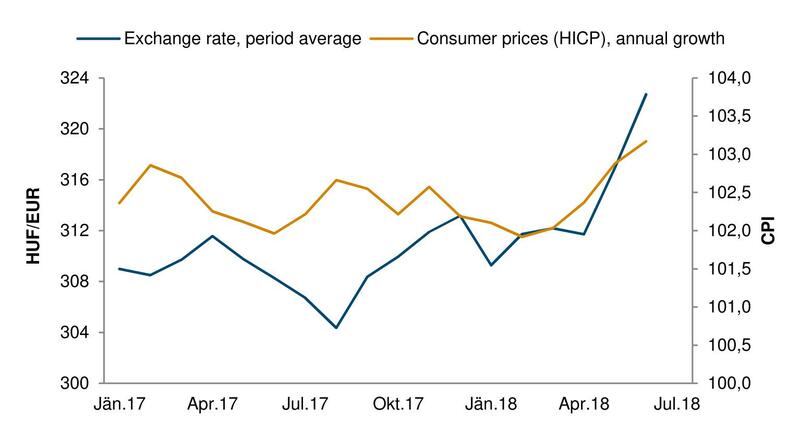 However, while it seems that the recent weakening of the forint did not affect the June inflation data, this is not guaranteed to last. Quarterly annualised core inflation (which shows what annual inflation would be if the trends of the last three months prevailed for a full year) has doubled since the beginning of the year, hinting at a pick-up in inflationary pressures. The weak forint makes imported goods and services more expensive (although the connection is weaker than it was before the 2008/09 crisis). Source: wiiw Monthly Database incorporating national and Eurostat statistics. If Hungarian inflation data continue to defy the central bank’s expectations, and inflation threatens to break out from the 2-4% toleration band, the central bank will have to change its communication, acknowledging that under certain conditions it is ready to adjust its currently extreme loose monetary stance to defend the currency. An exchange rate weakening to or beyond HUF 340/EUR may force such a step. However, should the turn in the central bank’s communication come too late, it may not be sufficient, and concrete monetary policy tightening measures will become unavoidable. This could include a suspension of unconventional measures, which would restrict the liquidity in the banking system, or, eventually, raising the policy rate. A major crisis is not likely in the short run. However, it is high time that the central bank comes down from the clouds and adjust its communication (and if necessary actual monetary policy measures) to the rapidly changing reality, to avoid paying a high price for falling behind the curve in the medium term.